Small town romance and suspense sure comes with big time emotions in the latest Adams Grove novel. 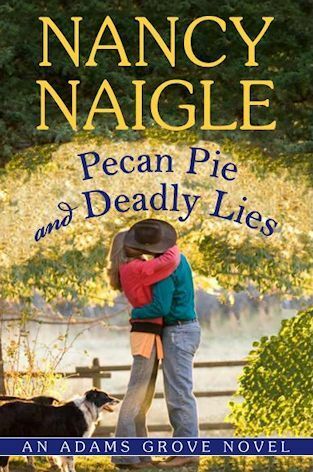 I have read all of Nancy Naigle’s Adams Grove books and so far Pecan Pie and Deadly Lies is my favorite. It’s all about Cody Tuggle and Kasey Phillips for me. I fell in love with both of these characters in Out of Focus, and even though they have another very tough situation going on in this story, there is a lot of hope for their future. Kasey is finally settling into life since husband’s death and the kidnapping of her son about a year ago and Cody is ready to settle down from life on the road as a country music star. In Pecan Pie and Deadly Lies, Cody needs a place for he and his band to stay due to a cancelled concert. Cody did so much to help Kasey in the past she wants to do this for him and the band. The adventure begins from there. Not just between Cody and Kasey romantically, but someone ends up murdered with all fingers pointing towards Cody. Nancy’s stories are more mystery than suspense, so we find out who is murdered and then it’s all about finding out who did it.Throw in new (and old) romance, family, friends, groupies and agents you have a very captivating story. I had a really tough time pacing myself while reading Pecan Pie and Deadly Lies because I couldn’t wait to find out how they were going to clear Cody and see what was in store for the relationship between Cody and Kasey. Nancy is great at weaving in twists and turns to her story and keeps you guessing, which pulls you into the story even more. I like that her books tend to be more romance than suspense, even if it is clean romance and I wished for a little more action. Cody and Kasey’s romance is very sweet and well-suited for the story and the characters (although I think Cody would agree that there should be a more action). It was believable right down to the way Cody and Jacob (Kasey’s 5 year old son) interacted with one another. The addition of several secondary characters added to the story as usual. I enjoyed the mother-child interactions between Kasey and Jacob as well as Denise and Cody. Jacob, being 5, brings a whole bunch of energy to the story, which was entertaining. If you like small town, clean, romantic suspense, I really think you will like Pecan Pie and Deadly Lies. You don’t need to read Out of Focus first, but if you did, the relationship between Kasey and Cody would hold more depth and bring more emotions to the story. Pecan Pie and Deadly Lies is a sweet, down-home story of love overcoming all obstacles from the crossroads of small town and suspense. America’s beloved country superstar Cody Tuggle never expected to be one of America’s most wanted. At least that’s how he feels since he’s been accused of murdering his scheming agent. Desperate to prove he’s innocent, he turns to his only alibi, award-winning photographer Kasey Phillips, who recently toured with him and his band. After an exciting life on the road, Kasey has settled down in small-town Adams Grove with her five-year-old son. Unexpectedly reunited with Cody, she finds herself open to love again. But just when she’s ready to fall, everything she ever believed about him is called in to question, and she’s faced with more than just being his alibi. Cody has waited a long time for genuine love, and he can’t let this chance with Kasey slip away. But as the evidence stacks up, the accusations against him put a damper on the sparks flying between them. Can he convince Kasey he’s innocent, and will she clear his name in time? Or will their dreams of the future be the victim of a deadly lie?